BOISE, Idaho (Legal Newsline) - Idaho Attorney General Lawrence Wasden announced a settlement Wednesday with a Boise-based company to resolve allegations the company and its owner engaged in the unauthorized practice of law. White Hat Group and its owner, Mark Wicklund, allegedly charged consumers for legal services and failed to deliver. 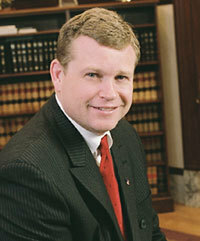 Wasden alleged that Wicklund falsely represented he was qualified to represent consumers in legal matters when that was not the case. Representing false qualifications constitutes a violation of the Idaho Consumer Protection Act. "Consumers must be cautious of non-attorneys who advertise legal services," Wasden said. "Unlicensed persons too often prey on people in need of immediate legal assistance and, on occasion, consumers who do not speak English. Paying thousands of dollars to persons who are unfamiliar with Idaho's legal system and laws only compounds the consumers' difficulties." Under the terms of the consent judgment, White Hat Group and Wicklund must pay restitution to former customers and reimburse Wasden's office for the cost of the inquiry. The agreement also prohibits White Hat Group and Wicklund from providing legal advice and practicing law in the state of Idaho. If Wicklund fails to comply with the terms of the consent judgment, he will be subject to a $50,000 penalty.